The wide range of climate change impacts and vulnerabilities expected in Europe is summarised in Figure 12.3 and Table 12.4. It is likely that climate change will have a range of impacts on water resources. Projections based on various emissions scenarios and General Circulation Models (GCMs) show that annual runoff increases in Atlantic and northern Europe (Werritty, 2001; Andreasson et al., 2004), and decreases in central, Mediterranean and eastern Europe (Chang et al., 2002; Etchevers et al., 2002; Menzel and Bürger, 2002; Iglesias et al., 2005). Most of the hydrological impact studies reported here are based on global rather than regional climate models. Annual average runoff is projected to increase in northern Europe (north of 47°N) by approximately 5 to 15% up to the 2020s and 9 to 22% up to the 2070s, for the SRES A2 and B2 scenarios and climate scenarios from two different climate models (Alcamo et al., 2007) (Figure 12.1). Meanwhile, in southern Europe (south of 47°N), runoff decreases by 0 to 23% up to the 2020s and by 6 to 36% up to the 2070s (for the same set of assumptions). The projected changes in annual river basin discharge by the 2020s are likely to be affected as much by climate variability as by climate change. Groundwater recharge is likely to be reduced in central and eastern Europe (Eitzinger et al., 2003), with a larger reduction in valleys (Krüger et al., 2002) and lowlands (e.g., in the Hungarian steppes) (Somlyody, 2002). 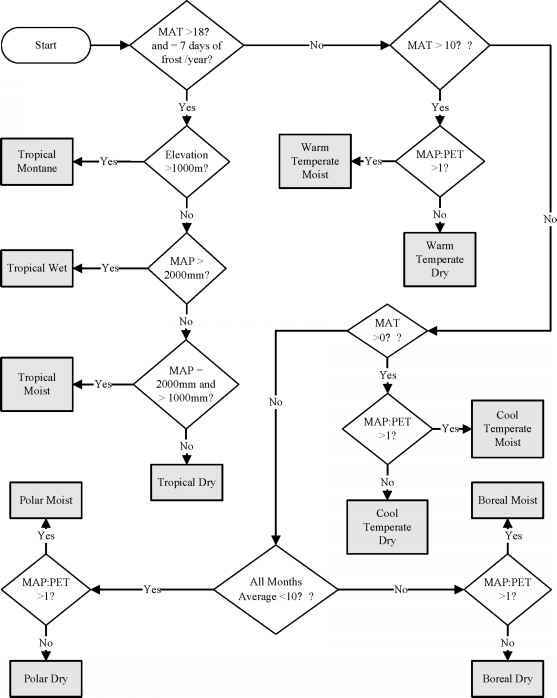 Figure 12.1. Change in annual river runoff between the 1961-1990 baseline period and two future time slices (2020s and 2070s) for the A2 scenarios (Alcamo et al., 2007). Alps; however, as glaciers shrink, summer flow is likely to be significantly reduced (Hock et al., 2005), by up to 50% (Zierl and Bugmann, 2005). Summer low flow may decrease by up to 50% in central Europe (Eckhardt and Ulbrich, 2003), and by up to 80% in some rivers in southern Europe (Santos et al., 2002). Changes in the water cycle are likely to increase the risk of floods and droughts. Projections under the IPCC IS92a scenario (similar to SRES A1B; IPCC, 1992) and two GCMs (Lehner et al., 2006) indicate that the risk of floods increases in northern, central and eastern Europe, while the risk of drought increases mainly in southern Europe (Table 12.2). Increase in intense short-duration precipitation in most of Europe is likely to lead to increased risk of flash floods (EEA, 2004b). In the Mediterranean, however, historical trends supporting this are not extensive (Ludwig et al., 2003; Benito et al., 2005; Barrera et al., 2006). Increasing flood risk from climate change could be magnified by increases in impermeable surface due to urbanisation (de Roo et al., 2003) and modified by changes in vegetation cover (Robinson et al., 2003) in small catchments. The effects of land use on floods in large catchments are still being debated. The more frequent occurrence of high floods increases the risk to areas currently protected by dykes. The increasing volume of floods and peak discharge would make it more difficult for reservoirs to store high runoff and prevent floods. Table 12.2. 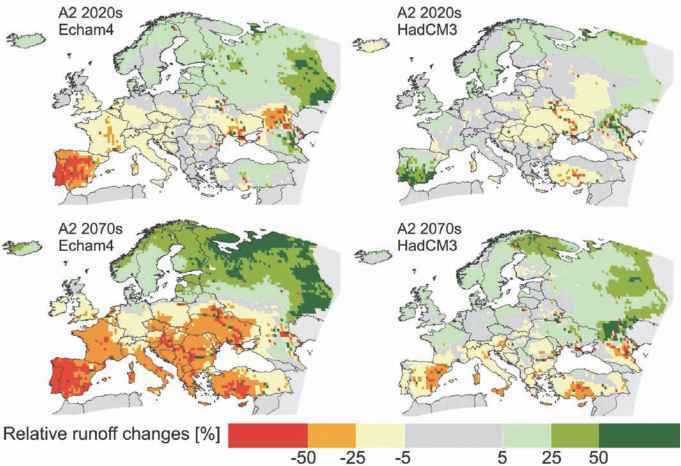 Impact of climate change on water availability, drought and flood occurrence in Europe for various time slices and under various scenarios based on the ECHAM4 and HadCM3 models.